The renowned journalist Ivan Medek devoted his whole life to battling the lack of freedom in any form. For nearly 15 years he addressed Czechs on “Voice of America”. After returning from forced exile he became President Havel’s office manager and chancellor. What is he doing now? 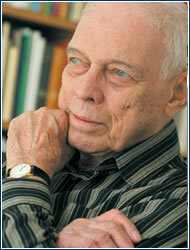 Even at age 80 he has an abundance of elan – he writes commentaries, speaks to the media, and sometimes goes to a pub. “That’s quite enough for a pensioner, isn’t it?” he chuckles. IVAN MEDEK is a very refined gentleman. He comes by it naturally – his grandfather, Antonín Slavíček, was an important Czech painter and his father, Rudolf Medek, was a writer and playwright. But the refined, liberal Medek didn’t fit well with the former regime. When in 1968 he expressed his objections to the Russian occupation, his promising career as repertory adviser for the philharmonic orchestra was interrupted and he was “hidden” as an editor in the Supraphon children’s section. Signing Charter 77 didn’t make things any better – he wound up working as an ambulance hand and a dishwasher. After a beating at the hands of the StB (Secret Police) in 1978, he emigrated to Wienna with a few belongings and a weak knowledge of German, where he was content despite his homesickness. He began working with Voice of America and the relationship lasted until 1993. “I see my work with Voice of America as the most useful period of my life,” Medek recalls. When he returned to this country he went to work for President Havel, acting as his office manager for six years and later as chancellor (1993-1998). When he left the castle there was much speculation in the media, some of which attributed his departure to disagreements with First Lady Dagmar Havlová. But Medek denies this: “I didn’t have even the slightest dispute with Mrs. Havlová,” he says. In 1998 he ran unsuccessfully for the Senate, but says that he wasn’t wild about the job. Today he lives with his second wife in a Letná apartment and has a very active life for a pensioner. He writes political commentaries for Rádio Classic every week and commentaries for the BBC twice a month, and he frequents Radiožurnál. This father of three with seven grandchildren and two great grandchildren likes to go to the neighborhood pub, where he regularly gets together with his large family, friends, and former colleagues. “I recently finished a book about my life titled, I’m Doing Fine, Thanks! That’s been my answer for years when people ask me how I’m doing,” he concludes with a smile.